Women on the Land: Devorah: "A Woman of Flames"
I’m excited about the Torah reading and Haftorah of Shabbat Shirah, Shabbat the Shabbat preceding TubShevat which is overflowing with women. The Haftorah is the song of Devorah, paralleling the Parashah which includes Miriam’s song, drumming and dancing with the Women at the Splitting of the Sea. Since I’ve been teaching about Devorah as part of my Women in Tana”ch class for many years, I had quite a bit of sources to draw from. “And Devorah, a prophetess, woman of Lapidot, judged Israel in that time” (Shoftim 4:4). The Hebrew word Lapidot means torches or flames. According to Chazal (our Rabbis), Devorah was called “Woman of Lapidot” because her face became lit up when she prophesied, and her words burned like flames in peoples’ souls. Ralbag explains that she was called the woman of flames because her level of prophesy was so high that flames would appear in the place where she was touched by prophesy. The phrase “woman of Lapidot” in Hebrew: "Eishet Lapidot" can also be translated as: “A woman of fiery enthusiasm.” Metzudat David explains, “A woman of valor, vigorous (זריזה) in her deeds like a flame.” Malbim states that because Devorah’s deeds were vigorous and enthusiastic like flames, she was naturally prepared for prophesy. Moreover, Devorah’s prophesy was an important reason for Israel's salvation in her days. The midrash asks why prophesy and leadership was given to a woman, when Pinchas the son of Elazar was alive at that time? The answer is that when Hashem chooses give Divine inspiration, neither gender or rank makes a difference: “What is the virtue of Devorah that she prophesied for Israel and judged them? May heavens and earth stand witness, be it a gentile or a Jew, a man or a woman, be it a male-servant or maid-servant, according to a person’s actions is he worthy of Ruach Hakodesh (Yalkut Shimonin, Shoftim 4). What was so great about Devorah’s actions that Hashem chose her to become prophetess and leader of her generation? In addition to being a prophetess, Devorah led a normal life as wife and mother. We learn this from another possible interpretation of the phrase: “Woman of Lapidot,” namely, that Devorah was married to a man named Lapidot. In contrast to Devorah, who was extremely learned, Lapidot was not a man of the book, and he stood in the shade of his famous wife. The Midrash explains: “…Devorah’s husband was an am ha’aretz (ignoramus). She told him, ‘Come and I will make you wicks. Bring them to the sanctuary in Shiloh. Then your lot will be among the kosher ones, and you will merit the World to Come.’ His name was Lapidot because his wife made wicks. She would contemplate and make thick wicks, in order to make their light great…” (Yalkut Shimonin, Shoftim 4). According to Alshich, it was in the merit of making the wicks thick that Devorah merited prophecy. The greatness of the wick-making was the way Devorah tackled the difficult situation of being spiritually and intellectually superior to her husband. She was keenly aware of her husband’s difficulty in finding his own place within their relationship and in society, without impeding his wife’s career, or succumbing to low self esteem. By initiating a project, in which they would be partners in bringing light and Divinity into their relationship, as well as to all of Israel, she enabled her husband to arise from his inferiority complex, and prevented them both from growing apart. By making wicks she entered his domain and strengthened his strength, as his name was Lapidot, and which means flames. Making wicks is a metaphor for making a vessel for the Divine presence in the world, manifested through the light of the Tabernacle – G-d’s home on earth, and within their personal Jewish home – the reflection of the Temple. The fact that she made the wicks thick testifies to the intensity and splendor (hidur) of the light she drew down from above. Her prophecy was a natural extension of becoming a vessel and a channel for Divinity. It was through connecting with her husband in a true spiritual way that Devorah became a complete vessel for the Divine light of prophesy. “And she dwelled under the date palm of Devorah between Rama and Bet-el, in mount Efraim: and the children of Israel came up to her for judgment” (Shoftim 4:5). Devorah embodied the peak of initiative, leadership, and modesty. She acted consistently both in the sphere of her home and in the national sphere. Devorah placed her seat of judgment under a date palm, outside her house, on one of the city’s most trafficked streets, to ensure that all matters should be decided in public, thus avoiding being in seclusion with any man (yichud), and averting suspicion and gossip about intimate contact with other men. In order to avoid immodest situations, she was willing to forgo the comforts of a house, and spend most of her time without protection from the cold of the winter, or from the heat of the summer. Care for her family and modesty are the qualities that enabled Devorah to be so successful in her national leadership. As “Eishet Lapidot” she helped her husband reach perfection, and by sitting “Under the date palm” she ensured that no other man interfered in the holy union with her husband. Devorah, she judged Israel in this time…Come and see, two women of this world who said song and praise to G-d in a way that no man in the world ever did! Who were they? Devorah and Chana… (Zohar, Part three, Page 19/b). Rav Aviner explains that the highest level of speech is Shirah – song. Like the Song of the Sea, it conveys reality from an expansive, all encompassing, deepest perspective. The righteous King Chizkiyahu lost his opportunity to become the Mashiach because he didn’t recite Shirah (song) over the miraculous fall of the enemy of Israel – Sancheriv. His lack of song was due to his inability to raise himself above the events that took place in his time. 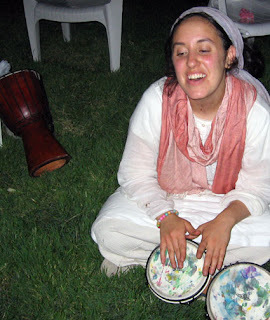 Devorah preceded him, and taught us a model for praising Hashem for His miracles in the highest way of song. According to the Shelah, King Chizkiyahu actually did recite song, but only after the miracle of victory. When he was in danger, although he trusted Hashem completely, he refrained from singing to Hashem. Devorah’s song, on the other hand, was preemptive. She sang her song of triumph, prior to the actual victory, and through her emunah she brought about the miraculous victory. In the same way, the emunah of the Jewish women in Egypt brought about the redemption. They packed their drums because they trusted that Hashem would perform miracles for them, and they prepared to praise Him in song, music and dance. The song of Devorah contains secrets and multiple hints for hastening the redemption and the arrival of Mashiach. The phrase ביום ההוא – “on that day” (Shoftim 5:1), which Devorah mentioned in her song parallels the verse: “And Hashem will be King over all the earth: on that day Hashem will be one and His name one (Zechariah 14:9). This teaches us that reciting this song is a segulah (remedy) for the redemption both personal and for all of Israel.